If you are planning on purchasing a new pair of work boots than Irish Setter and Red Wing may be on your list of brands to consider. Both brands offer similar styles of boots, with Red Wing focusing more on Heritage models and Irish Setter offering boots better suited for work and hunting. What’s the difference between Red Wing and Irish Setter? The main difference between Red Wing and Irish Setter is that Red Wing still handcrafts their Heritage line of boots in America while all Irish Setter boots are made overseas. Because of their focus on heritage boot making styles, Red Wing Heritage boots will opt-out of cutting edge footwear technology and focus on tried and true bookmaking techniques and materials. Some people appreciate the heritage style for it’s time tested quality while others may prefer the newer materials and designs offered in Irish Setter brand boots such as new anti-slip rubbers and flame-resistant uppers. To better understand the differences in the two brands let’s dig deeper into each of their origin stories. Red Wing Shoes is a brand best known for their high quality American made work boots. The brand itself is over 110 years old and one of the oldest footwear manufacturer’s in America. Today Red Wing footwear can be split into two categories: Their Heritage line which is still made in America and their Work line which is manufactured overseas. In this comparison we will be focusing on Red Wing’s Heritage work boot and how it compares to Irish Setter’s work boot line. 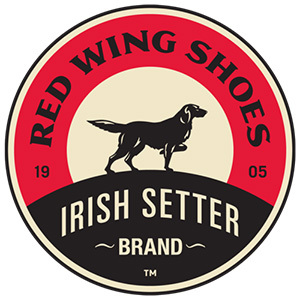 Irish Setter is a brand owned by Red Wing Shoes. The brand was first launched in the 1950’s with their introduction of American made hunting boots. Irish Setter soon expanded to offer specialty work boots. Today, all Irish Setter boots are manufactured overseas. Although mostly made in China, many Irish Setter boots still use U.S. made S.B. Foot Tanning leather in their work boots. 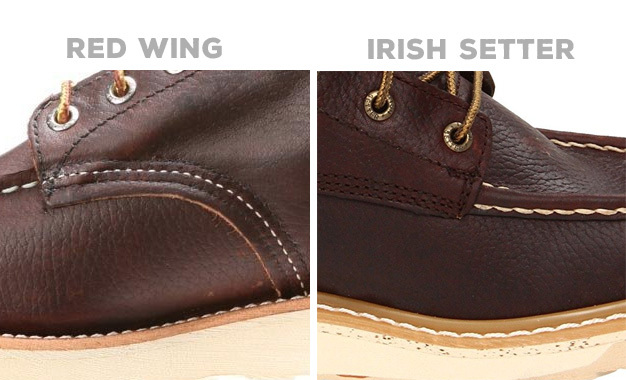 In this comparison we will focus on the Red Wing Heritage Classic Moc vs the Irish Setter Ashby. Both of these moc toe work boots offer similar features. Let’s take a closer look at the two brands and explore the key differences. Although the Irish Setter Ashby are half the price of a pair of Red Wing Classic Moc Toe boots, you will be surprised to learn that there is some overlap in the materials used. Both brands use S.B Foot Tanning leather on their uppers. This is a high quality full-grain leather that is made in America and known for it's time-tested durability. Inside the boot you where you’ll see one of the main differences between Irish Setter and Red Wing Heritage boots. Irish Setter features a removable PU footbed. Removable are known to deteriorate over time and will need replacing as the boot is used and abused. Red Wing stays true to it’s heritage tradition and features a leather footbed. Although there is a longer break-in period with leather footbeds, they mold to your feet over time and provide excellent comfort. 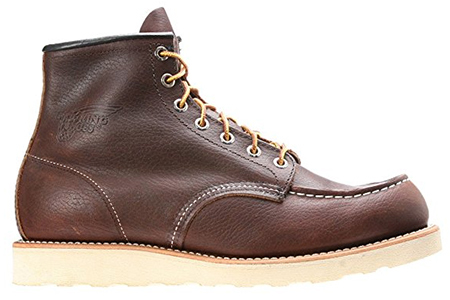 Both boot brands implement Goodyear Welt construction in their respective moc toe boots. If you look closely at the uppers you’ll notice that the leather paneling differes greatly between the Irish Setter Ashby and the Red Wing Classic Moc. Red Wing uses simple leather paneling and thick robust stitching that is common for a heritage boot. Irish Setter has more leather paneling and opts-in for thinner triple stitching in parts of the uppers. Both the Red Wing Classic Moc Toe and Irish Setter Ashby use a christy wedge rubber sole in their respective models. Both outsoles feature traction treading with shallow lugs to easily shed mud and debris. The main difference between the outsoles is that Irish Setter has put more of an emphasis on addressing work conditions. The outsoles on the Irish Setter Ashby are heat-resistant (up to 475 degrees) as well as slip, oil and abrasion resistant. The Irish Setter Ashby also meets Electrical Hazard ASTM F2413-11 safety standards. This is important for those who are concerned with safety on worksites. The outsoles on the Red Wing Heritage Classic Moc toe does not specifically have these safety features. Unfortunately if you would like these outsole safety features you will have to look into the Red Wing work line of boots which are not made in the USA. It’s no secret that many people experience longer break-in periods with Red Wing Heritage boots. This is due to tougher leather on the uppers and a full leather footbed. Once the break in period is over however, these boots should fit like a glove as the leather molds to your feet. As for fit, Red Wing suggests you go one half size smaller than your regular shoe size when purchasing Heritage boots. Because of it’s materials and construction, you can expect a shorter break in period with the Irish Setter Ashby work boot. The padded footbed and wedge outsole provide for an immediate comfortable wear. Fit varies on Irish Setter boots from true-to-size fitting to going a half-size smaller than your regular shoe size. One more important thing to note is that Red Wing boots are significantly heavier than Irish Setter boots. At albs 5oz, the Red Wing Classic Moc Toe weighs almost twice as much as the Irish Setter Ashby which comes in at 1lb 9oz. For those who work on their feet, this is an important fact to consider especially if choosing a lightweight boot is important to you. Choose Red Wing Heritage if you prefer an American-made work boot that is recraftable and built to last a lifetime. The option to repair your boots using Red Wing’s authorized dealer network will pay dividends on your initial investment. The simple leather paneling and lack of overall branding will appeal to those who want back-to-basics work boot without modern bells and whistles. Irish Setter is perfect for those who want a good value boot that is made with harsh working conditions in mind. Their added safety features and optional safety toe options are ideal for those who need to put safety over fashion. Irish Setter work boots however are not recraftable so you will need to replace them sooner than a pair of Red Wing Heritage boots. This may add up to more cost over time and is something to consider when going with a non-heritage boot. If you are looking for a moc toe work boot then Irish Setter and Red Wing are not your only options. Other American made boots such as Danner and Thorogood offer similar features and are fairly priced. We invite you to explore our list of best wedge soled work boots to compare all of your options. Although we compared Irish Setter and Red Wing Heritage work boots above, it’s worth commenting on Red Wing’s own work line and how it generally compares to Irish Setter. Unfortunately, Red Wing’s work line is made overseas with most of the production taking place in China. Although it bears the Red Wing brand, it does not match the craftsmanship of the Heritage line. Red Wing’s work boots are not repairable and are similar in quality to other brands in the $150-200 price range. Although Irish Setter and Red Wing offer different flagship models, there is little difference terms of quality and construction. Both brands also offer comparable safety features and styles. Because of this overlap Irish Setter and Red Wing’s work line cost about the same with Red Wing having a slight edge on contruction quality. When it comes to affordable American made work boots few brands are better than Chippewa and Thorogood. We put the two brands head to head in this Thorogood vs Chippewa boot comparison. We delve into the difference between Timberland and Timberland Pro work boots. Learn which boots are right for you with this in-depth comparison. Newer PostTimberland vs Timberland Pro - What’s the difference?